Director – Guillermo Del Toro, Screenplay – Guillermo Del Toro & Matthew Robbins, Producers – Guillermo Del Toro, Matthew Greene, John Jashni & Thomas Tull, Photography – Dan Laustsen, Music – Fernando Velazquez, Additional Music – Tim Davies, Visual Effects Supervisor – Dennis Berardi, Visual Effects – Mr X. Inc, Special Effects Supervisors – Rocco Larizza & Laird McMurray, Makeup Effects – David Marti & Montse Ribsi, Production Design – Thomas E. Sanders. Production Company – Legendary Pictures/DDY. Around the turn of the 20th Century. Edith Cushing is the only daughter of a successful businessman in Buffalo, New York, and has aspirations of being a writer. Her father is approached by Thomas Sharpe, a poor baronet from Cumberland in England, and asked to back the idea of a clay-digging machine. Her father turns the proposal down but Thomas succeeds in charming Edith and sweeps her off her feet. After digging into Thomas’s background, her father pays him money to go away and leave Edith. However, someone sneaks into her father’s club and batters him to death against the bathroom hand basin. In the aftermath, Thomas and Edith are married and return to the decaying Sharpe ancestral home of Hadfield House in Cumberland. When Edith learns that the house is named Crimson Peak because of the red mud dug from the mines below, she realises that this is what the ghost of her mother warned her about. As she is visited by the ghosts of the dead in the house, Edith starts to discover the secrets that Thomas and his sister Lucille keep. Guillermo Del Toro is one of the most prominent genre directors of the 2000s and beyond. Del Toro has an exemplary directing career with works such as the vampire film Cronos (1993), the intelligent bug film Mimic (1997), the Spanish Civil War ghost story The Devil’s Backbone (2001), the Marvel Comics adaptation Blade II (2002), Hellboy (2004), the awards-winning Pan’s Labyrinth (2006), Hellboy II: The Golden Army (2008), the giant robot film Pacific Rim (2013) and subsequently the amphibian man romance The Shape of Water (2017), which won Del Toro an Academy Award as Best Director. Beyond that, Del Toro has placed his fingers into just about every other creative pie imaginable in the last decade, having produced other genre works like Chronicles (2002), Hellboy Animated: Sword of Storms (2006), Hellboy Animated: Blood and Iron (2007), The Orphanage (2007), While She Was Out (2008), Julia’s Eyes (2010), Splice (2010), Don’t Be Afraid of the Dark (2011), Kung Fu Panda 2 (2011), Puss in Boots (2011), Rise of the Guardians (2012), Mama (2013), The Book of Life (2014), Kung Fu Panda 3 (2016) and Pacific Rim: Uprising (2018), as well as the tv series The Strain (2014-7) based on his novel. He also co-wrote The Hobbit: An Unexpected Journey (2012), The Hobbit: The Desolation of Smaug (2013) and The Hobbit: The Battle of the Five Armies (2014). 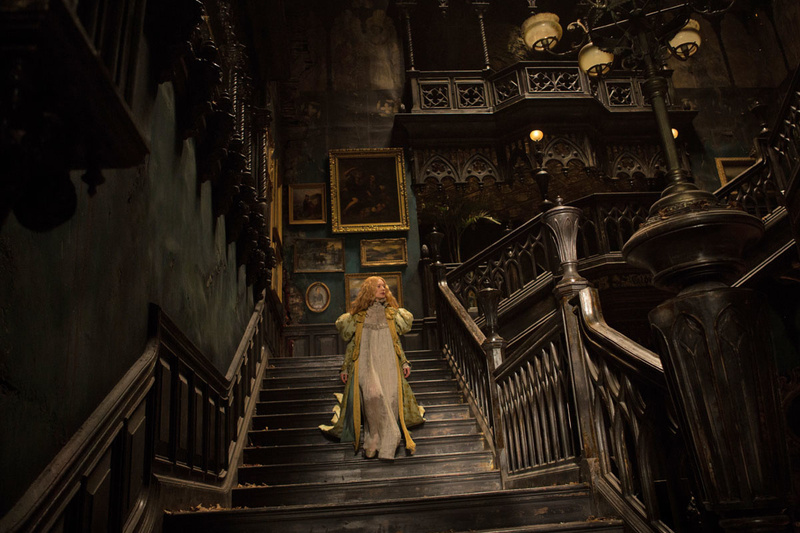 With Crimson Peak, Guillermo Del Toro turns his attentions to the Victorian Ghost Story. This has a long tradition going way back to the 19th Century and has appeared on film numerous times. Del Toro had previously made the slightly more modern ghost story with The Devil’s Backbone and had produced the Spanish-made ghost stories The Orphanage and Mama, as well as Don’t Be Afraid of the Dark, which wasn’t quite a ghost story but drew on many of its elements. With Crimson Peak, Del Toro and his co-writer Matthew Robbins give us a story original to the screen that is rich in Gothic tropes – the innocent young heiress; the dark-clad and suavely charming stranger; the arrival at the gloomy mansion that is a crumbling shadow of its former glory; the family secrets that lie behind locked doors; the ghosts come to give warnings of ill omens. I was hoping with Crimson Peak that Guillermo Del Toro would do something that would set a new benchmark for the Victorian ghost story on screen. He certainly creates one of the more gorgeous looking ghost stories ever made. Tom Hiddleston tends beautifully crafted automata and antique digging machines. The scenes in Buffalo take place in exquisitely surrounds where you can see that the set dressers had the time of their lives matching the crockery and table settings. Mia Wasikowska goes through a luscious range of costumes, ones that have even been colour-coordinated to strikingly stand out against the inhospitable Cumberland moors. There is a beautifully decaying mansion built on multiple stories with a roof open to the sky (given the difficulty of heating castles and large old estate houses and its being open to elements, you suspect that with Hadfield House would have an indoor temperature well around the double digits below zero). With geological improbability, the walls of the house drip with wet scarlet red clay – in reality, if the clay were in fact that soft, the house would have well and truly sunken into the ground by now – but is an effect that looks eye-catchingly pretty on screen. The major problem with this is that it sidetracks from the ghost story that Del Toro is trying to tell. You are so distracted by the loveliness of the colour palette, the detail that goes into the background, the looming monstrosity of the Gothic edifice that it tends to get in the way of your actually becoming absorbed in the drama. You sit watching and think that a ghost story should have some boo moment to it that digs itself in memory but that never comes (more on that below). The problem is that not only is Del Toro is serving up a distracting array of scenography but that he has also opted to deliver CGI ghosts. It was well serve to remember how well this has gone before – as Exhibit A, the prosecution offers up The Haunting (1999). We just see some billowing and strange creatures occasionally floating through the air but nothing that ever makes an audience jump out of their seats. The problem also with Crimson Peak is the structure of the story. Whereas a traditional Gothic story would probably have opened with the heroine’s arrival at the mansion, Guillermo Del Toro spends nearly an hour of the running time on plotting that would probably be regarded as prologue to the main action proper, which has the tendency to off-balance the story. Much of this also leads to the build-up where you expect that Crimson Peak is going to scare our pants off. Only it doesn’t and the film instead does a bait and switch on us. [PLOT SPOILERS] Despite the film’s build-up as a ghost story, the ghosts that turn up prove to be not that relevant, sort of only supporting characters in the drama. What we instead get is more of a mundane Gothic potboiler about the dark aristocrat and his even more vicious sister who are plotting to steal the heroine’s fortune. Where we expected to be made to jump out of our seats at Del Toro’s mastery, all we instead get is a climax that involves an extended girl-on-girl catfight. 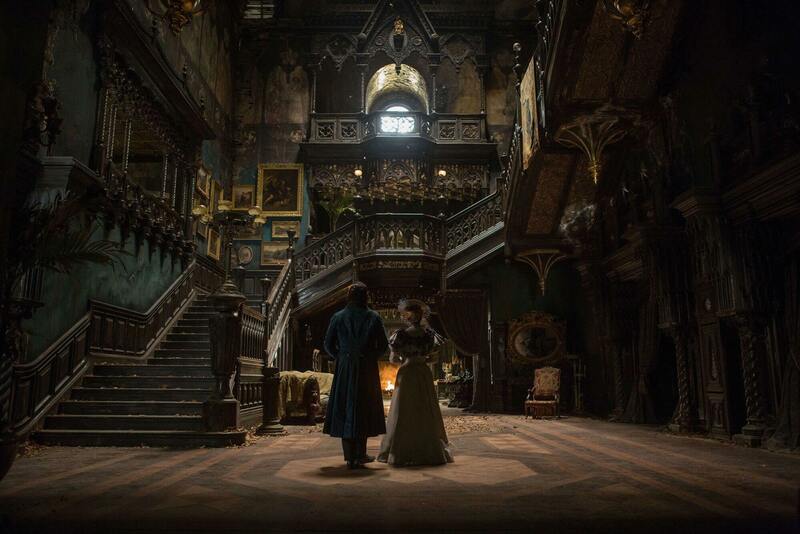 Try and think of it another way – take all the set dressings, costumings and CGI out of the film and replace it with a standard dressed Gothic mansion and how would Crimson Peak have stood up as story? The answer, you suspect, is a fairly run of the mill and average one. The atmosphere could have made the difference but that seems to have been trumped by the production and costume design departments. (Winner for Best Production Design at this site’s Best of 2015 Awards).